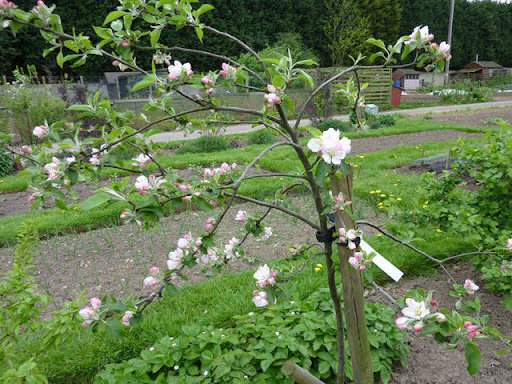 It is now the turn of the fruit trees to be stars of the show! They are a bit more flamboyant than the currants and gooseberries that prefer a more subdued display. 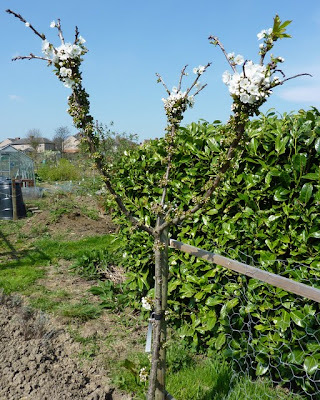 Although the plum and gage trees seemed that they were going to disappoint, they have tried their best and I am hoping for at least some fruit. 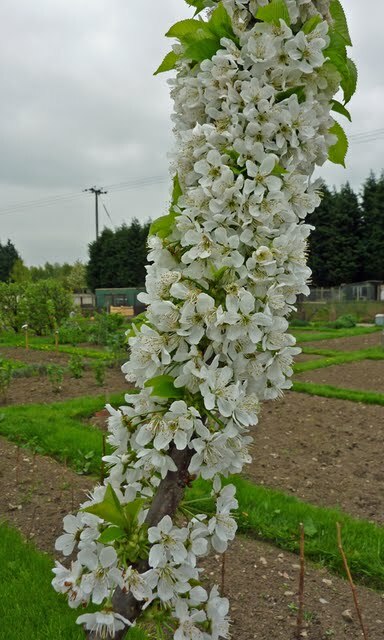 The photo below is the Victoria plum. The Oullins gage that last year produced masses of delicious yellow plums seems to be going to have a rest this year. 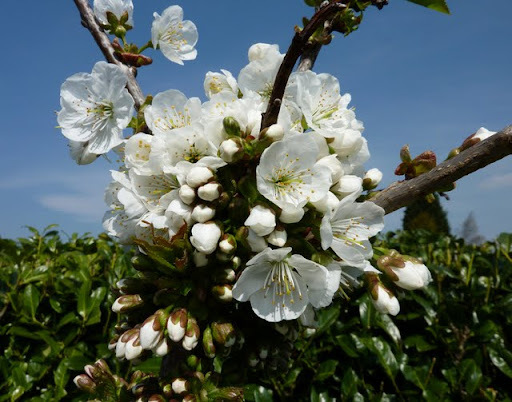 The small cherry tree - Summer Sun - is wearing it's blossom like a sleeve. 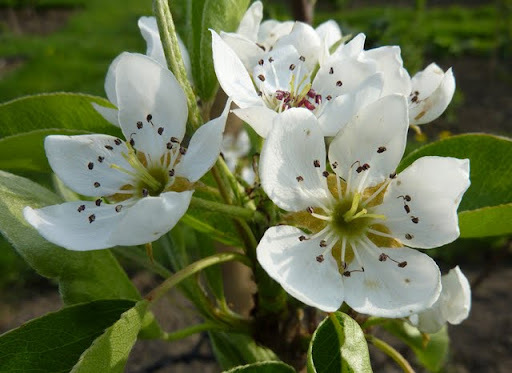 New pear trees planted on the plot have a few flowers too. 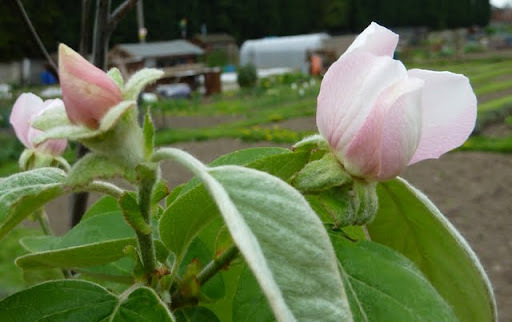 The newly planted quince also has a few flowers - although most haven't quite opened yet. We have a couple of crab apples in the garden. 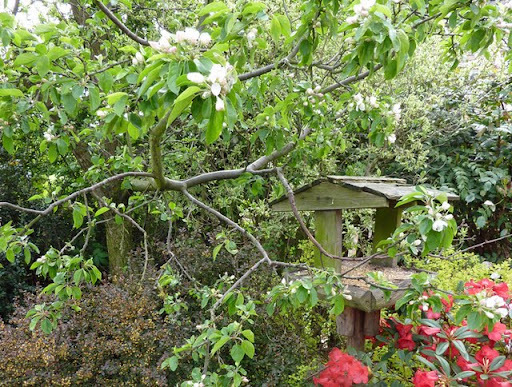 One is John Downie which produces edible fruits as well as being a popular refuge for birds waiting for their turn to visit the bird table. The other variety - Profusion is also a popular bird haunt. It doesn't produce edible fruit - other than for blackbirds etc but I didn't want it to feel left out. 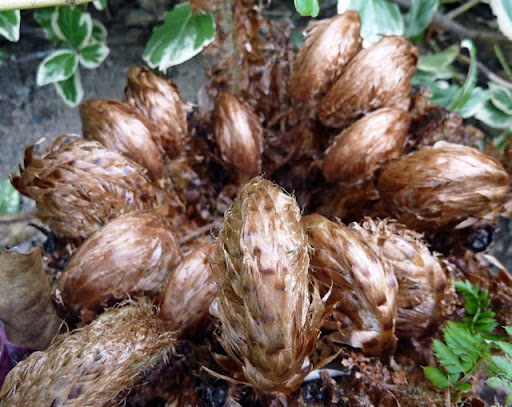 Once all the flowers are fully opened it looks spectacular - it has bronzy coloured leaves too. 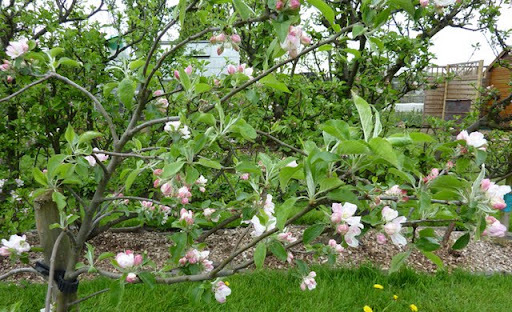 The young apple trees are beginning to flower - this will really be their first fruit bearing year - I hope! The one below is Egremont Russet. We inherited some old cordon apples when we took our plot. Although they are very old now they still produce a good harvest of fruit. Although, in past years, many of the fruits have been spoiled by pests such as codling moth caterpillars that burrow into the fruits. This year we are making a concerted effort to deal with any pests. 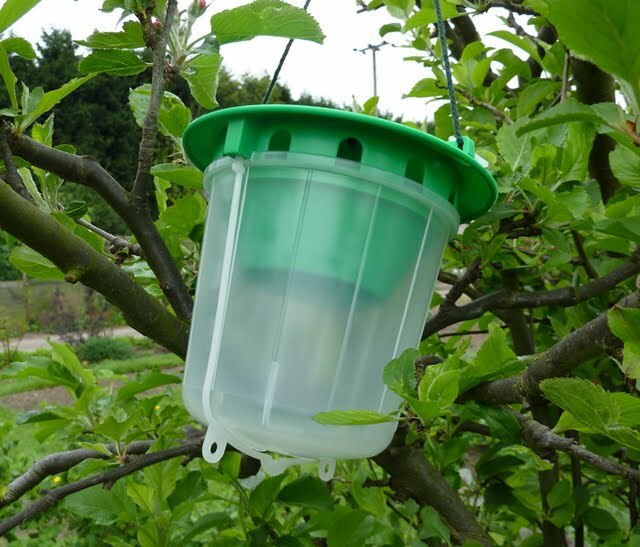 We've already greasebanded everything and yesterday hung a codling moth trap. Apparently May is the correct month to install it. The lure inside the trap is supposed to give off a pheromone that attracts male moths, entrapping them and preventing them mating with the females. The lure can then be replaced each year. It also is supposed to be effective over half an acre so our plot neighbours should benefit too. A second trap has been hung on the apple trees in our garden so we will just have to wait and see if they work! PS - I bet you never noticed that I had changed the header picture again! Having a plan of what you are planting where is important. Having planned your plot means that you don't end up running out of space because you haven't left room for one of the later plantings. Martyn looks after our planning and used to draw plans up using a drawing package but when we switched to Vista the software wouldn't run. We had already had to upgrade lots of other software - who didn't when switching to Vista? - so when we found the GrowVeg system the £15 a year subscription seemed well worth the cost. 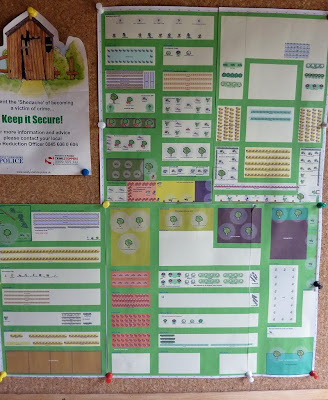 We've used it ever since and have an up to date plan on the noticeboard in our shed so that we know exactly what to plant where. 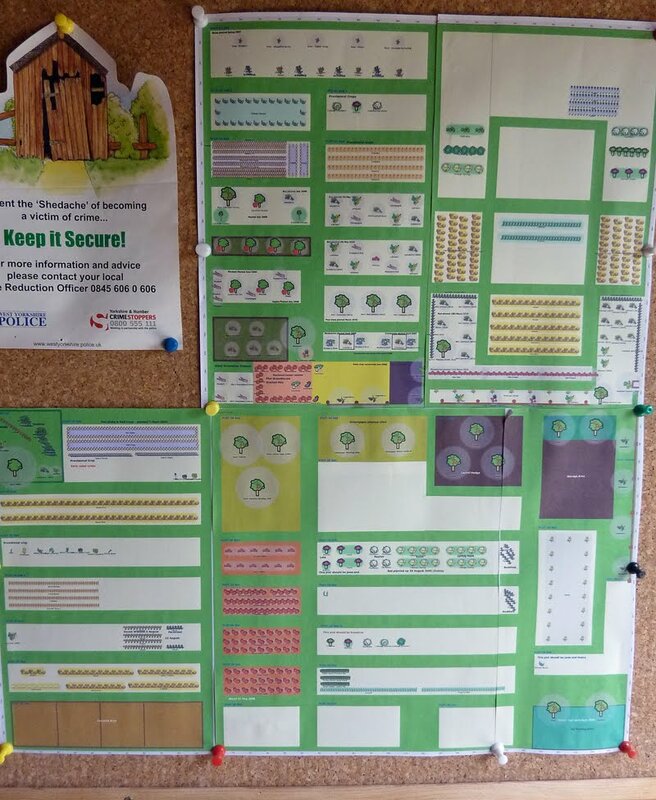 A bonus is that the system 'remembers' where you planted crops in previous years and warns you if you are planning to plant crops in places that you should avoid. Invasion of the giant spiders. I love ferns - we have lots of them in the garden - lots of different shapes, colours and sizes. At this time of year I cut back the old fronds to reveal the fronds that will uncurl this year. This variety reminds me of a giant spider with its legs curled over its body. The sharp sighted of you may notice that it has more than eight legs - well I reserve the right to use artistic licence. 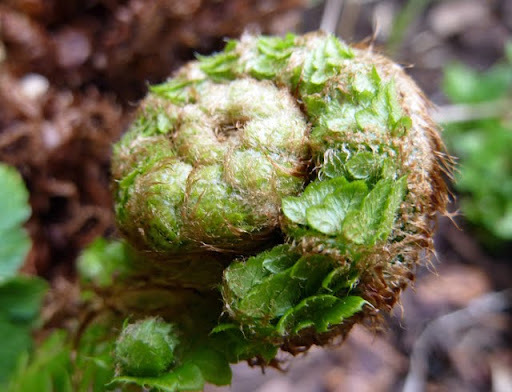 This fern has fronds that are just beginning ti uncurl and looks more like a scaly snail. It's amazing how often the spiral shape turns up in nature. I wonder how many examples we could find if we looked really carefully? 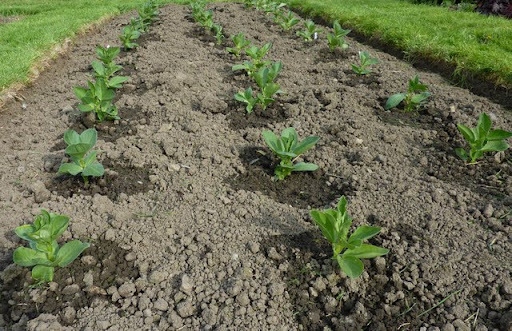 Besides concentraing on ferns I did do other things last week - like planting out the young broad bean plants that had been hardening off in the cold frame. My complete diary entry for last week can be read on my website here. This week's weather conditions are described here. My diaries date back to 2007 with all entries for earlier years being housed in my diary archive here. For those of you who like photos - and who doesn't? - my photo album for last week is here. At last we have caught up! 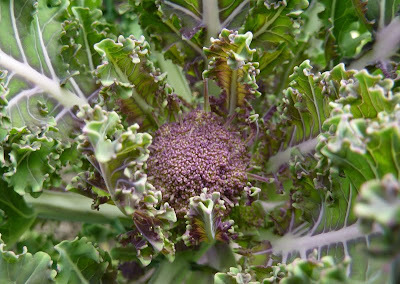 We had our first helping of purple sprouting broccoli today - I know many of you will say - "So what we've been harvesting for a week or two?" - but for us it is an occasion. We also brought some fresh mint and some rhubarb back with us. The smell of mint always puts my tastebuds on red alert. Some spreads into the grass paths and smells gorgeous when the grass is cut! 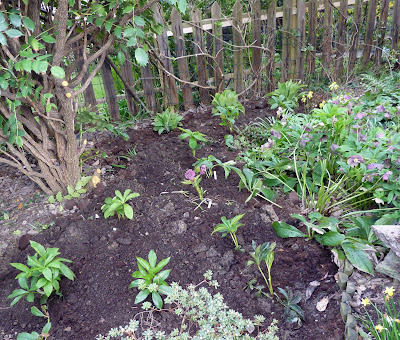 Also brought back from the plot were some of the foxgloves and the eleven hellebores that I bought last year. All have been growing on at the plot until we had prepared the area in the garden for them. They are now planted in their final position in our shady area under a magnolia tree. I just hope they survive the journey and thrive! If they do they should look great next year - can't wait! There seems to be good news and bad news. 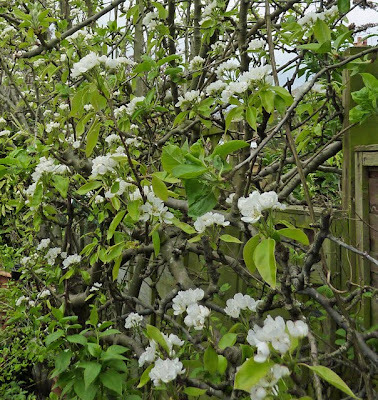 The good news is that the cherry tree we planted a couple of years ago has lots of blossom. It's rather strange though - it hasn't really grown any branches and the blossom is growing alll the way up the trunk and along the three stumpy branches growing out of the top of the trunk - I don't really care as long as the blossom develops into fruit and it will be easier to net this way - but still strange! 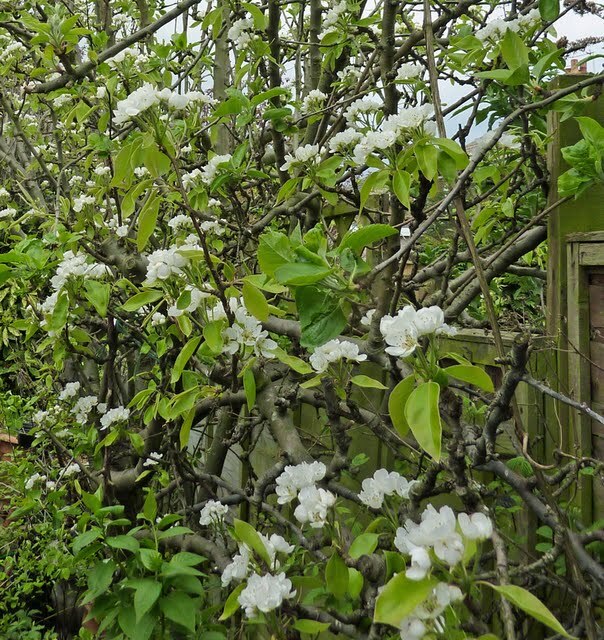 The bad news is that it doesn't look as though we are going to have many plums or gages this year as the trees seem distinctly lacking in blossom. They were loaded last year. 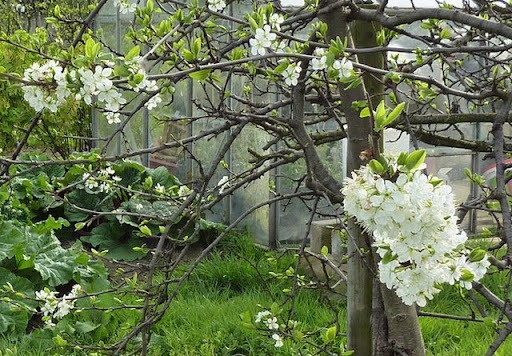 It does seem that our plums crop well every other year - they maybe need a rest and to gather their strength for a bumper harvest again next year. We managed to sow carrots, peas and salad leaves this weekend. As usual we are growing under enviromesh to protect from carrot fly. May not be pretty but is pretty effective and that's what counts! To read my complete diary entry for this week and browse the photo album click on the links. Help urgently required in Leeds area! 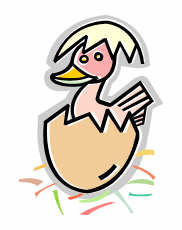 I'm trying to get hold of a poultry incubator asap, I bought some hatching eggs for my broody brahma at the weekend and when got them home discovered one was an Aylesbury duck egg, don't think I can hatch it at same time as chucks under brahma, and don't want to let it perish. I live locally and thought someone may know of someone who could help??? Elaine is sorted out and has siad she will let us know what happens! The photo only shows a small proportion of the smashed empty snail shells. 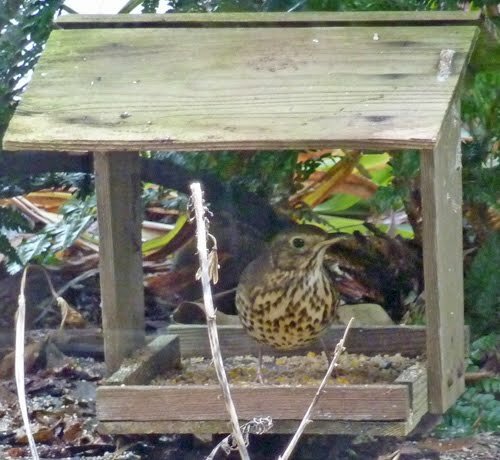 Over winter we noticed that a song thrush - it could have been more than one -was a regular visitor to the garden. So I guess it has found this part of our garden to be an ideal spot for disposing of its victims. It's typical song thrush debris. I know it's a bit gruesome but I hope that it keeps up its efforts to control our snail population. 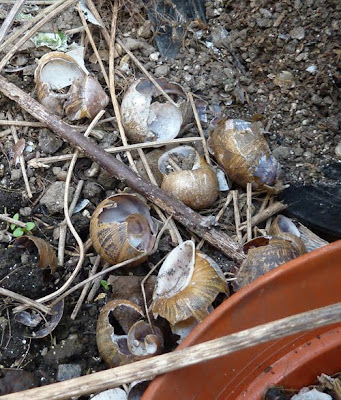 I regularly find empty snail shells in other areas of the garden but they have been intact so I'm not sure whether we have other snail hunters with a different technique for winkling out the soft bodies. Could it be frogs using their tongues to hook the snails out or could some sort of parasite get into the shell to dispose of them from within? An ideas? I came across a hedghog in the garden this week; it was still fast asleep. Fortunately I was carefully moving a pile of dead leaves from a flower bed. I say fortunately as I could have been raking them up with a garden fork and inadvertently injured it. As I had disrupted its sleeping arrangements - I had to gently relocate it under a shrub and cover it with a pile of dry leaves. Contrary to popular information the hedgehogs in our garden don't seem to have a taste for slugs etc - well who can really blame them? We have often watched hedgehogs walk past or even over slugs without so much as a sniff. I know hedgehogs have poor eyesight but their noses work really well so they can't have just missed them. 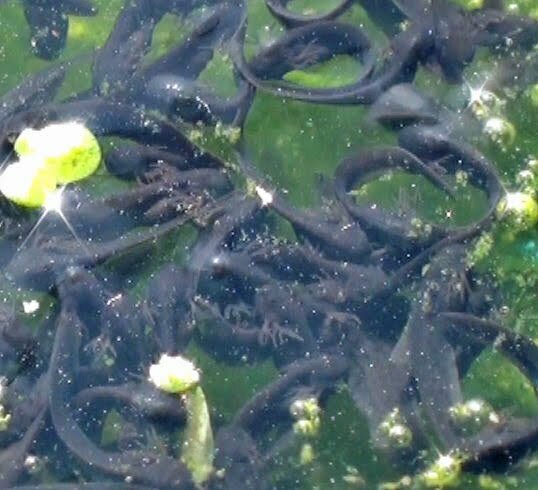 I'm not sure whether the fish have finally disposed of all the tadpoles or whether they have wriggled off into the bowels of the pond. Let's hope it's the latter! The pond liner is black and so they would be really difficult to spot. This means no more photos unless they become visible again - sorry! This post is specially for Carrie. We only decided to erect a shed on our plot last year. As is the case on most allotment sites, theft can be a problem with sheds being a prime target for night-time unwelcome visitors. As we don't live within walking distance of our allotment site it hasn't been a problem to use our car as a mobile shed. Leaving tools on site would also have meant that we needed two sets of everything - one set for the garden and one for the plot. However, as we were spending more time on the allotment we decided to finally buy a shed - not for storage but as a retreat from cold weather and as somewhere to sit and have a coffee break or two! So the shed arrived! We bought and laid some lino so that the floor was easier to keep clean after trudging in and out with muddy boots and acquired an old kitchen table and four chairs. The chairs seats were recovered using a plasticised material so now we had somewhere to sit. Hooks and shelves were put up to allow for storage of small items such as plant food etc. A bench was also built to add more seating as we found that the shed was also a focus for entertaining plot neighbours especially when it started to rain! The bench also provides a useful area for keeping items - such as our cool bag containing provisions - off the floor. It also provides some storage for bulky messy items such as netting. Nothing else is stored in the shed as other items including a small stove would be transported on each visit - although stoves are not very expensive they seem to be popular with thieves who no doubt find them easy items to shift at car-boot sales! 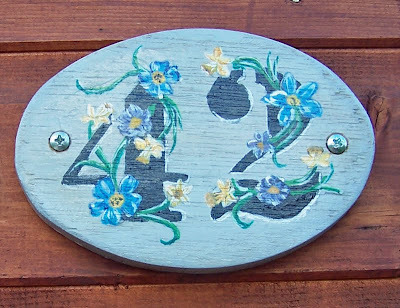 When the weather was not fit for gardening I spent a little time painting a plot number which seems to be standing up to the weather well. Maybe I should do one for the house too! During the few really hot and sunny days we popped up a gazebo between the shed and greenhouse to give us a shady place to sit and take a break. We have even been known to have breakfast and to have Sunday dinner on the patio outside of the shed. 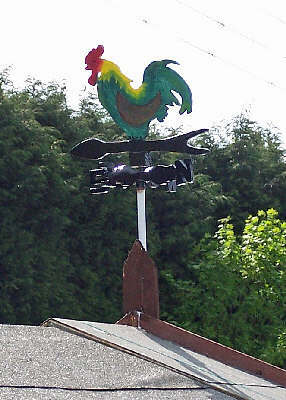 We haven't quite kept up with our plot neighbours though as they have a weather vane on their shed! 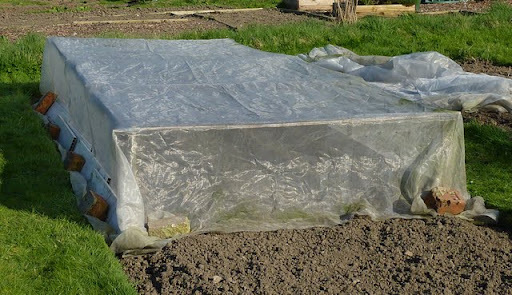 On another note if you are thinking of adding a shed to your plot check out this website before buying as they offer some very cost effective solutions. 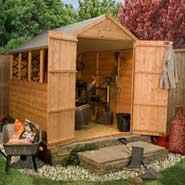 Click here for more information about choosing a shed. Not only did the lovely weather last week spur us into a frenzy of action on the plot but it has also brought out other busy bees too. Literally! Lots of huge queen bumble bees are busily searching fror a prime location in which to start their new families. The one below decided to check out our shed. 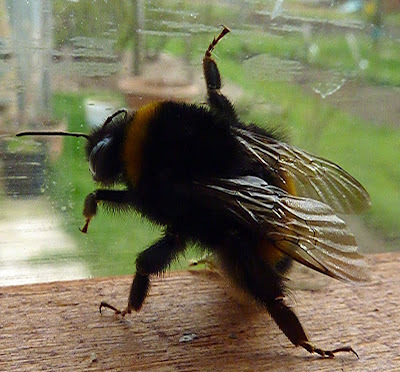 This one was carefully escorted outside. (By the way can you spot the lacewing - the head is just visible behind the bee). I only noticed it when viewing the photograph. Others checked out our garden greenhouse - in fact they are probably still in there somewhere. When not looking for a suitable home they visited our gooseberry and blackcurrant bushes for a sustaining drink and hopefully to pollinate the flowers. A less welcome royal visitor was the queen wasp buzzing in the window of our bedroom - we certainly didn't want her setting up home there! We had our first sighting this year of peacock butterflies. One was sitting soaking up the sun before fluttering off. We have been as busy as bees too. All our potatoes are now planted and many, many seeds sown. The grass paths on the plot have had their first mowing and permanent beds containing various fruit bushes and trees have been tidied. 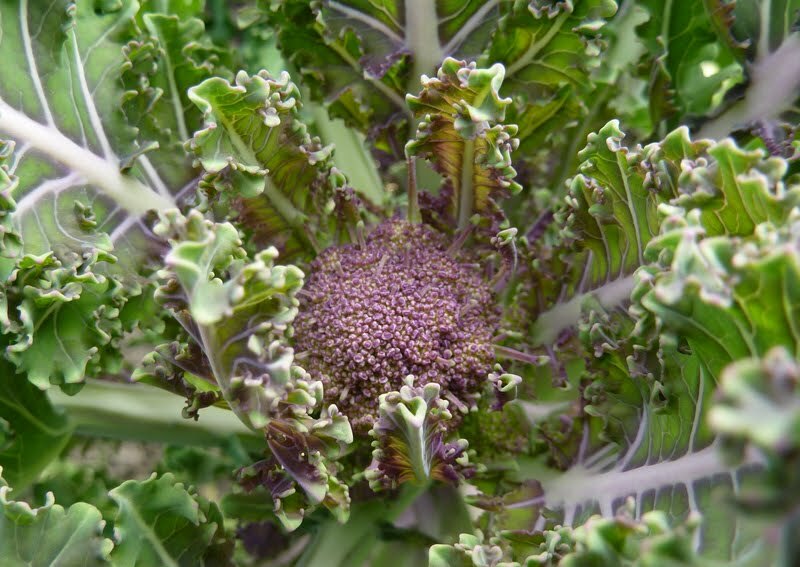 At long last the first signs of sprouts are evident on our purple sprouting broccoli! What's more we even took off our big sweaters and fleeces and sat outside for our coffee breaks! Click here for more information about bees and here for more information about wasps. The tadpoles are now quite active and wriggly but still keeping to the jelly. If you look clasely at the video and photo you can spot the feathery gills that have developed. The fish still wait patiently on the sidelines! I've changed the header photo especially for Zeb! I'm still going to change it again when the plum trees flower though! Just a really quick post to thank my list of Followers. Noticed that this week it had reached 30 which is a sort of milestone so thanks to everyone who has taken the time to add themselves to my Followers list. Also thanks to the people who make regular comments as this sort of adds to the blog content! 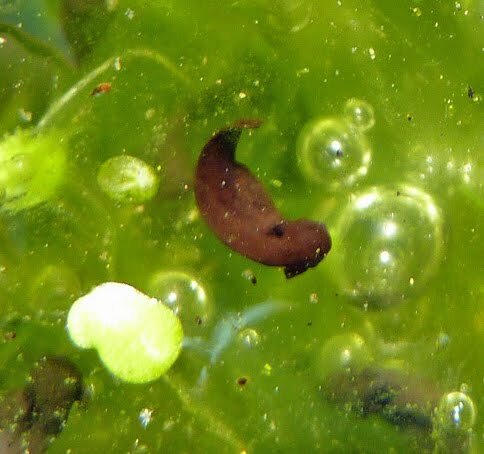 The embryo tadpoles still haven't broken free from the jelly but are continuing to change shape. You can see that the gill flaps have developed. The fish are still keeping a close watchng brief. It's a good job that the frogs lay so many eggs. 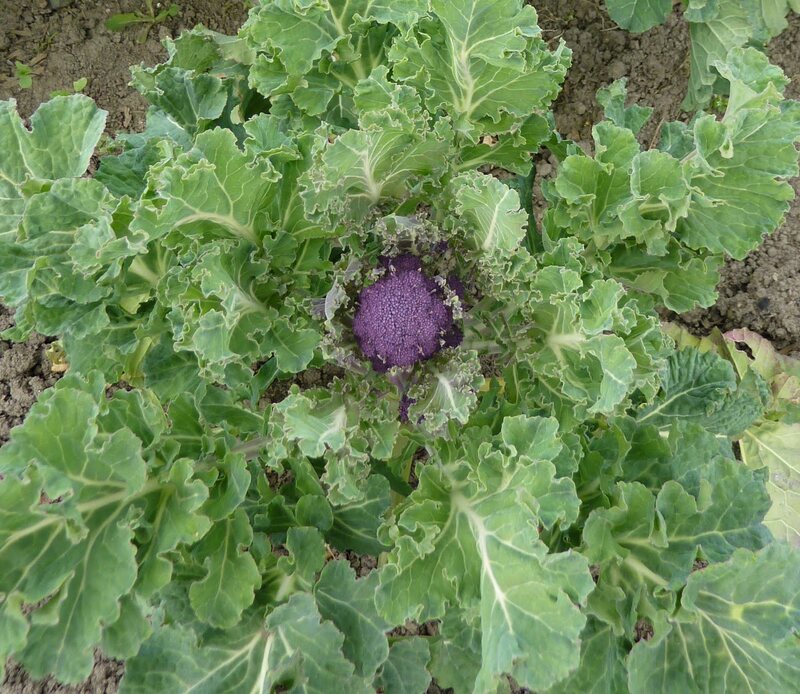 Having just come back from our holidays we didn’t visit the plot last week so the start of the April diary very much concentrates on activities closer to home in the garden. Nature is beginning to stir itself having decided that, however cold it may still be that spring has arrived and it had better get on with its business - so we have decided to follow suit by making a concerted start on seed sowing. 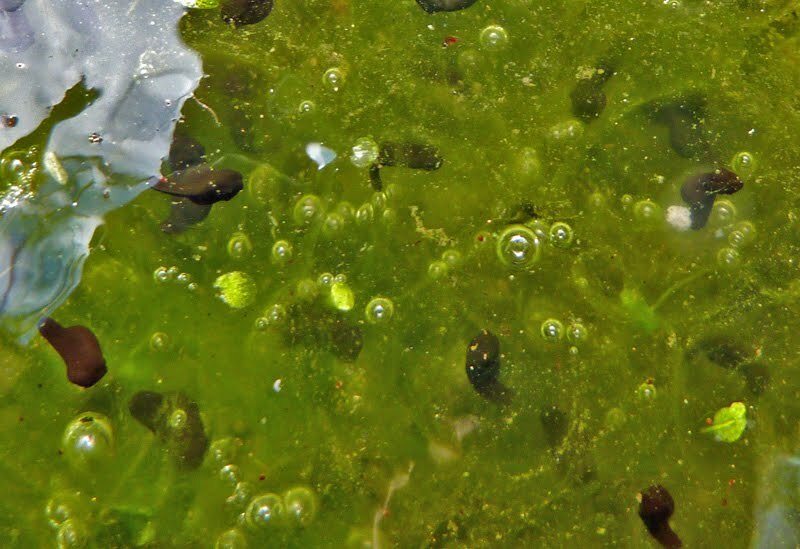 Well some frog spawn has so far survived the attentions of the fish that continue to patrol the edges of the jelly. 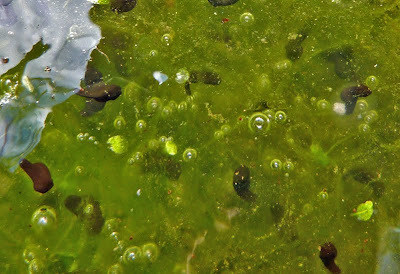 The black dots that were the beginnings of the tadpoles are now dividing. Some have already become comma shaped. 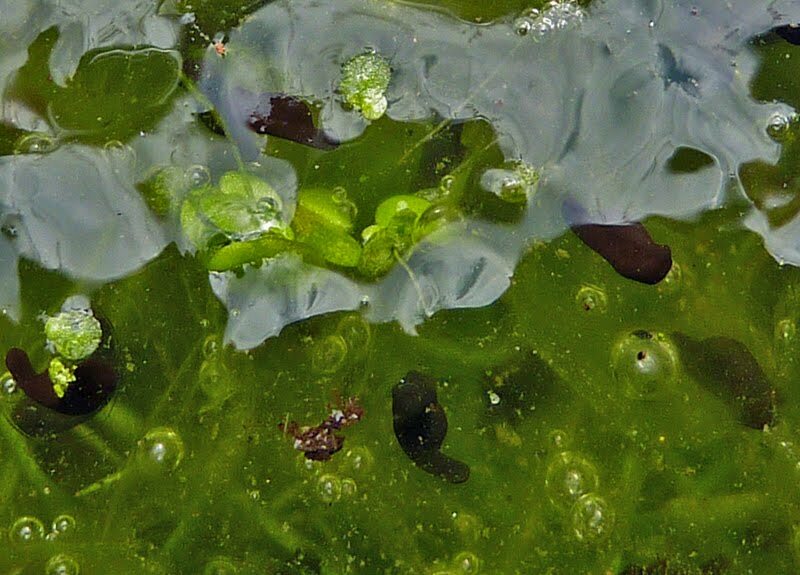 Once the tadpoles are free swimming it will be difficult to monitor what is happening and they will be an easier target for the fish. 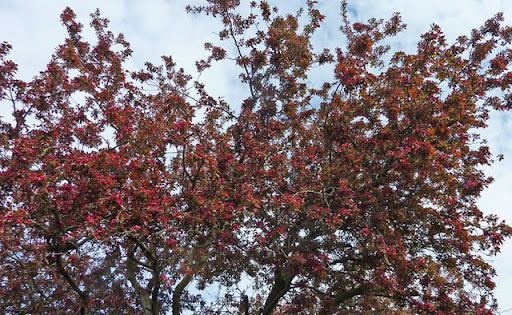 If you visit regularly you may have noticed things have been quiet on both this and our weather blog for a little while. We spent the last week in Dorset which means not only have the blogs been quiet but activity in the garden and on the plot has ground to a halt too. The weather diary will be up to date soon but the March diary on the website is now complete with a very short entry for the last week or so. Just to pad it out I decided to bore everyone by including some holiday photos too! Click here to vist the diary entry. And can any of you bird experts identify the birds in this photo? 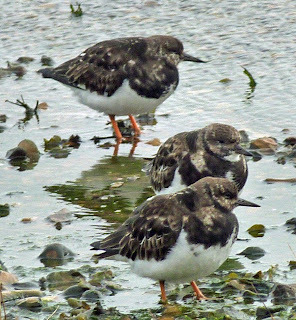 The nearest I can get is I think they may be juvenile ring plovers. I'm afraid the photo isn't as clear as it should be as the birds were some distance away and with a gale force wind and freezing cold hands the camera shook a bit! They were on Hurst Spit on the Solent where the coastal area was quite shingly - which is apparently the type of habitat plovers like! Please post a message if you can confirm their identity. After advice from the bird detectives I think we can safely say that the birds are Ruddy Turnstones (thanks Damo and Amanda). Just got back from our holiday in the New Forest and as usual the mail was piled up. 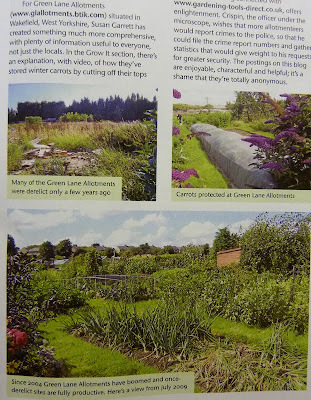 It included the latest copies of two of the garden magazines that we subscribe to. 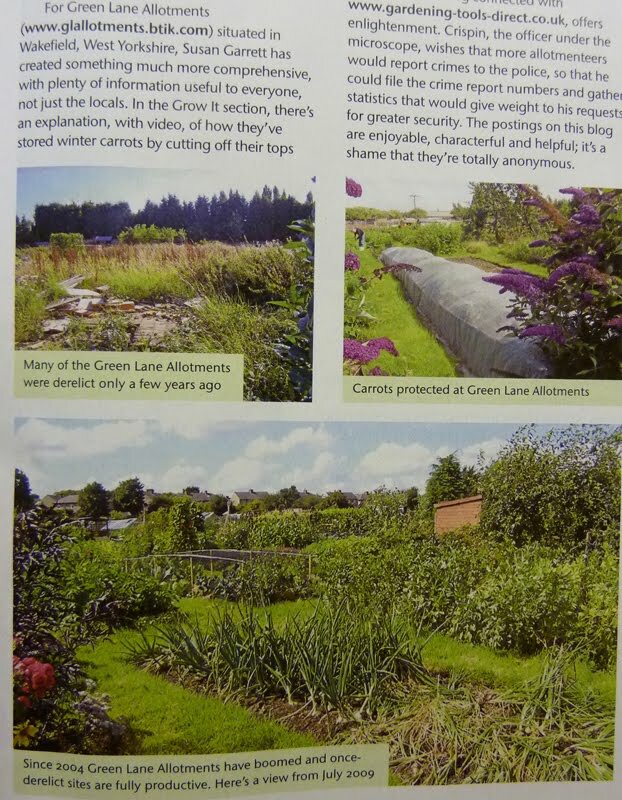 One "Kitchen Garden" has an article each month about garden related websites and this month it has included my website! I've already had messages from people who have read it and visited as a result. I know not all visitors may end up here but it would be interesting to know of any that do!